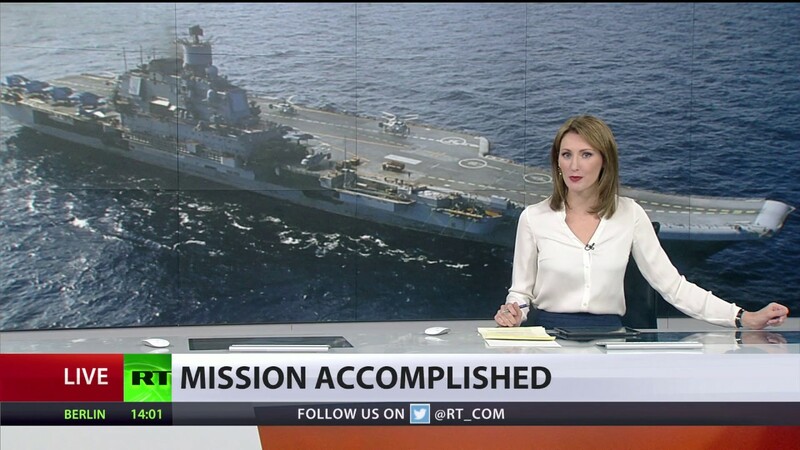 RT is the flagship of the Kremlin’s international communications flotilla. Like an aircraft carrier, it is deployed far from Russian speaking shores in the international waters of the Arabic, English, German, Spanish and French languages. RT’s aim is to confuse and disinform foreign audiences with Russian state propaganda. Similar to aircraft carriers, RT travels together with a number of smaller vessels. But not all of RT’s support ships are open about belonging to RT’s battle group. 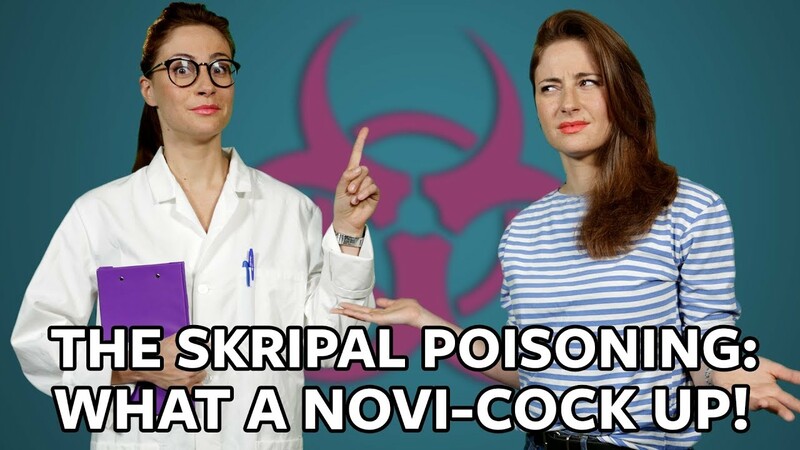 At least two projects have branched out and built international audiences online while avoiding clear references to their mothership, RT, or their sponsor: the Russian government. RT’s most recent offspring is called ICYMI. The use of the internet acronym for “In case you missed it” hints at the desired target audience: younger people who cannot be reached via RT’s core product, the TV channel. ICYMI has Youtube as its primary channel, but is also present in social media, for example on Facebook. RT’s new project operates primarily via YouTube. A recent investigation by NBC News identified that the registration information of ICYMI’s website lists the same entity as the registration for RT’s website. RT confirmed to NBC that ICYMI is indeed a part of RT; also, the presenter ICMYI features in its videos is known as an RT host. ICYMI’s Facebook page reflects the fresh style, and most of the topics are central to the Kremlin’s foreign policy agenda. The connection to RT is not clearly advertised: ICYMI is not keen to display its true flag. Do you follow In The Now? 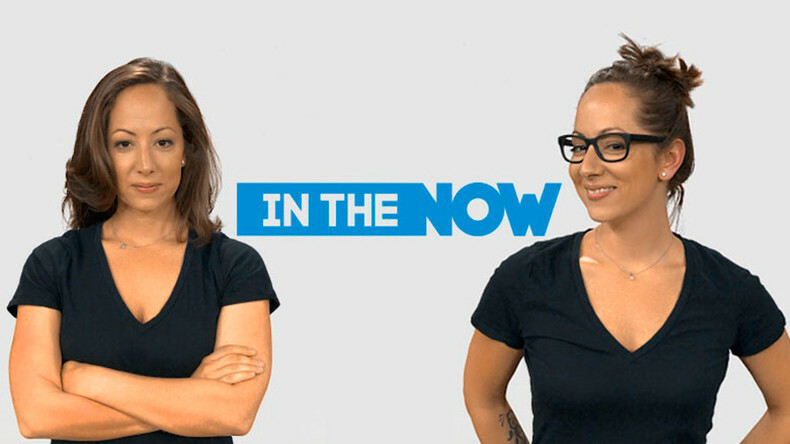 ICYMI shares some features with its sister ship, In The Now: both outlets appeal to younger audiences, and both operate as online video channels. But if ICYMI keeps political topics in focus on its Facebook account, In The Now mixes completely apolitical, often emotional and entertaining stories with less frequent political stories, which closely follow the Kremlin’s messaging lines. 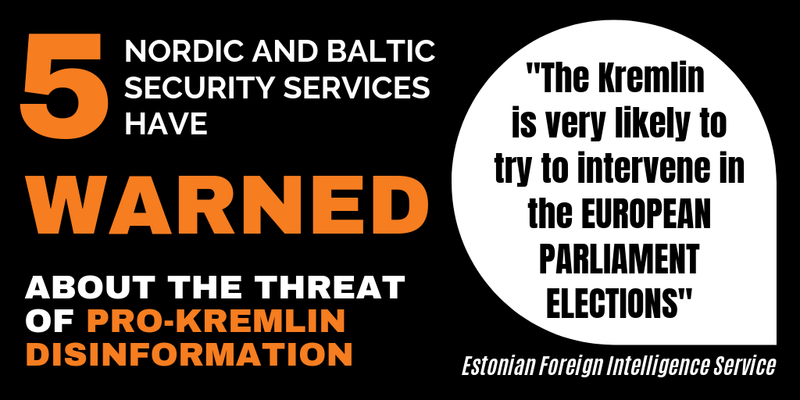 Many people find themselves following In The Now on social media after they have seen and liked one of the apolitical stories; not all have understood that they thereby opened their social media feed to a foreign state’s propaganda. Check for yourself if you are a follower of one of In The Now’s profiles, for example on Facebook or on Twitter. Click on the image to check for yourself if you follow In The Now on Facebook. A look at In The Now’s Facebook feed provides a good illustration of the method of attracting an audience with emotional and funny videos, but then suddenly adding Kremlin policy lines to the mix. One recent example is the publication of a video in which a female presenter with an American accent talks about how the MeToo movement has empowered women worldwide; but then suddenly criticises it for “leaving a lot of women behind. Women who live in countries who are f*cked by our foreign policy”. The flags of Iraq, Libya, Syria and Yemen are shown on the screen to rub in this clear Kremlin foreign policy line. In The Now uses the Metoo campaign to target American foreign policy. In The Now recently played a role in the Kremlin’s attempt to cover the gas attack in Douma, Syria, with a smokescreen of disinformation. The outlet featured an interview with a Syrian boy who was used as an alleged witness, while it later turned out that the TV interview with the boy had been made at a Syrian army facility where Russian military advisers were present. On top of the ICYMI and In The Now projects, RT also appears under the name Ruptly. RT’s staff and executives also frequently participate in and organise international conferences for television and video production professionals, clearly in an attempt to build international networks and obtain legitimacy. 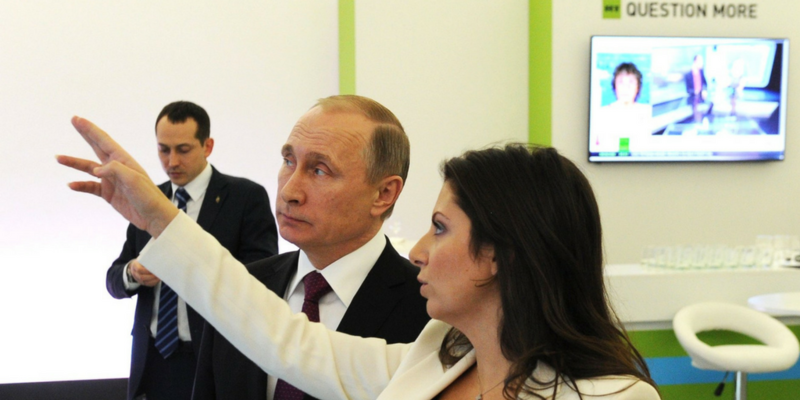 RT chief editor Margarita Simonyan gives President Putin a tour of the newsroom, which she says is like “a defence ministry“. RT’s strategy of branching out its operations comes in a time when RT is under pressure. YouTube has introduced a policy of labelling RT’s products and other state-sponsored propaganda videos; and in the UK, the national media watchdog Ofcom is investigating RT for violations of fundamental journalistic standards, which could lead to RT losing its broadcast license. 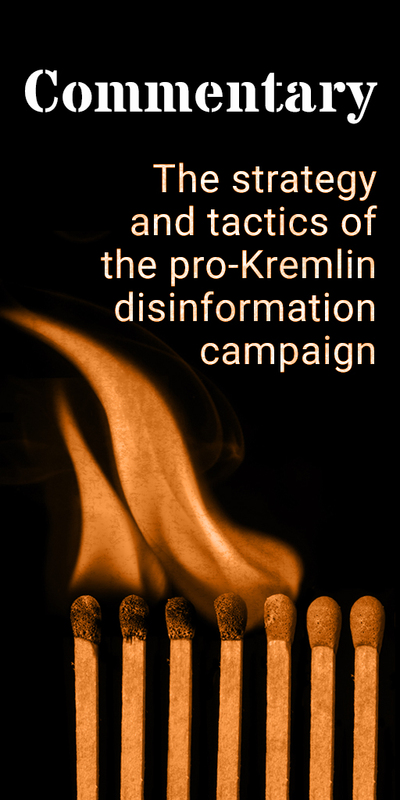 Other Russian state-controlled media, such as the international news agency RIA Novosti and the domestic TV channel NTV, have found themselves under criticism for systematically spreading disinformation. RT has been denounced by French President Macron as “not journalism”.